As a special end-of-term project, two art groups (aged 4-6 yrs) worked together to create one huge Hundertwasser-inspired collage. The Austrian artist and architect, Friedensreich Hundertwasser (1928 – 2000) created highly original, often fantastical, buildings and paintings, characterised by bright colours, organic forms and swirling, curving lines. He was fascinated by spirals, and rejected straight lines in his architecture and his art. 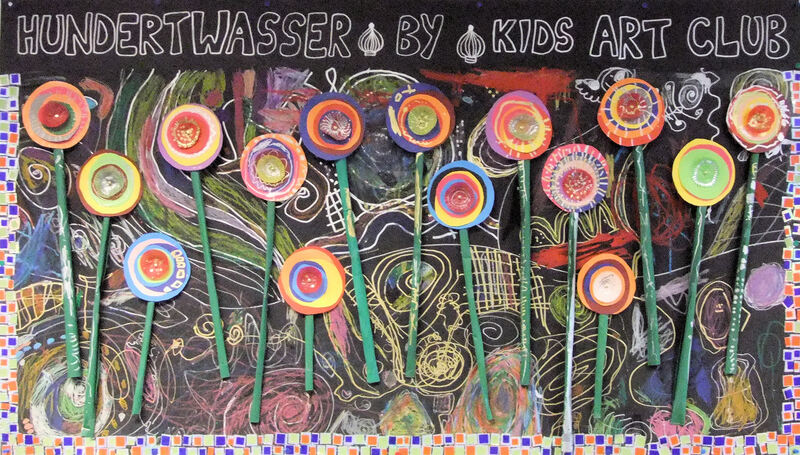 The children looked at some of Hundertwasser’s paintings of trees and flowers which look like lollipops, before assembling their own flowers by cutting out circles of different sizes from coloured paper and overlapping them, with colourful muffin cases to add texture and extra details drawn on using gold and silver pens. Meanwhile the other half of the group decorated the background, using pastels and metallic pens to draw typical Hundertwasser motifs – spirals, wavy lines and chequerwork patterns. When all the kids had done both activities, we assembled our huge lollipop picture, finishing it off with a mosaic border – very Hundertwasser!